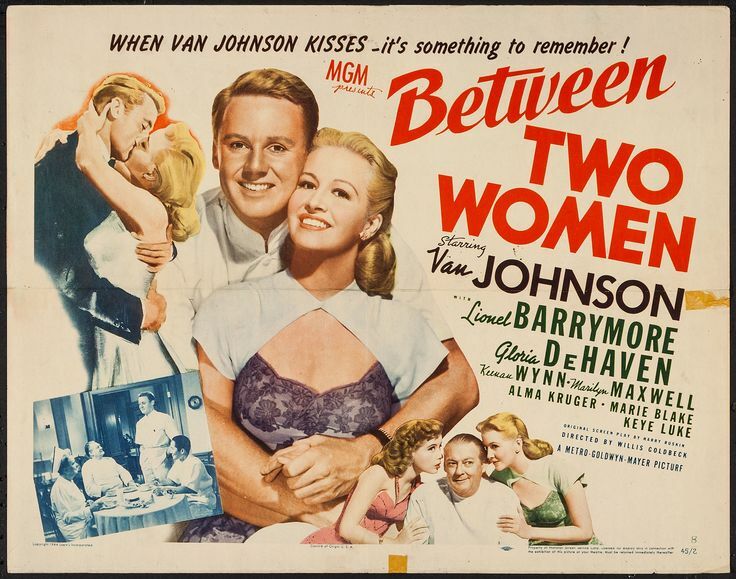 BETWEEN TWO WOMEN (1945) is a particularly engaging entry in the long-running Dr. Gillespie series, available from the Warner Archive. In this penultimate Gillespie film, Van Johnson makes his last appearance as Dr. Red Adams. 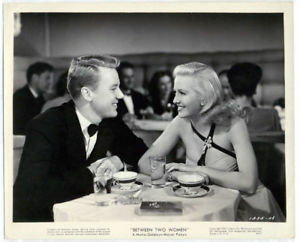 It was his fourth film in the series; he'd been simultaneously starring in bigger pictures such as A GUY NAMED JOE (1943), TWO GIRLS AND A SAILOR (1944), and THIRTY SECONDS OVER TOKYO (1944), and his career was taking off to stratospheric heights. After this film it was the "A" list all the way, as he became one of MGM's biggest box office stars. The title BETWEEN TWO WOMEN is somewhat misleading, as Red is still a one-woman man, sort of. Gorgeous, wealthy Ruth Edley (Marilyn Maxwell) is still chasing Red, for the third straight film, but he's worried about the fact she has so much money while he's trying to get his career off the ground. Ruth finally puts a scare into Red by completely backing off, and he starts to realize what he might be missing. 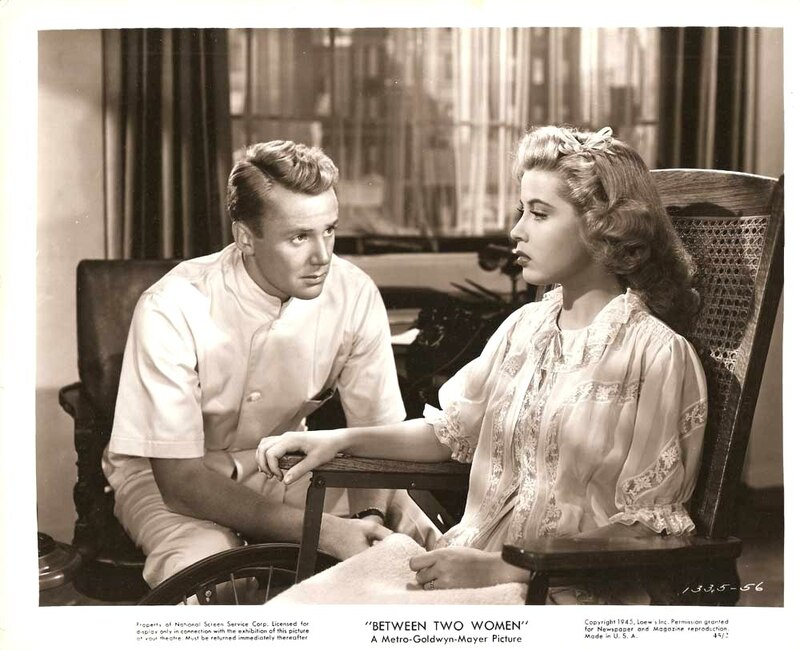 Meanwhile Red is helping a beautiful nightclub singer who can't eat, played by Gloria DeHaven, one of Van's costars from TWO GIRLS AND A SAILOR. The lovely DeHaven and Maxwell's contributions help keep the film light and fun to watch. And as if Red's not busy enough, hospital switchboard operator Sally (Marie Blake) becomes very ill and insists that Red handle her operation. This leads to a rather odd scene where all the hospital employees, even Dr. Gillespie's aide Conover, watch the surgery from the medical student seats above the operating room. This surely must be the most screen time Blake had in one of these films. For classic film fans who might not be aware, Blake was the older sister of singing star Jeanette MacDonald. Under her real married name, Blossom Rock, she played Grandmama on THE ADDAMS FAMILY (1964-66). Although Keye Luke is once again on hand as ebullient Dr. Lee Wong How, there's mercifully no reference to the long-drawn-out competition between the two men to be named as the official assistant to Dr. Gillespie (Lionel Barrymore). Keye Luke returns in the final film, DARK DELUSION (1947), alongside James Craig as Dr. Tommy Coalt. 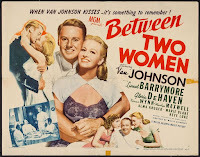 The BETWEEN TWO WOMEN cast includes Leon Ames, who has one scene as a patient of Dr. Gillespie (Leon Ames); Henry O'Neill as a theatrical agent; and Keenan Wynn as a nightclub MC. Additional series regulars who appear in this entry include Alma Kruger, Nell Craig, Walter Kingsford, George Reed, and Eddie Acuff. BETWEEN TWO WOMEN was directed by Willis Goldbeck. It's an 83-minute film which was shot in black and white by Harold Rosson. An historical footnote: MGM previously used the title BETWEEN TWO WOMEN for a 1937 film with Franchot Tone, Virginia Bruce, and Maureen O'Sullivan. Although the earlier film was also about a doctor, there is no connection with the 1945 film. 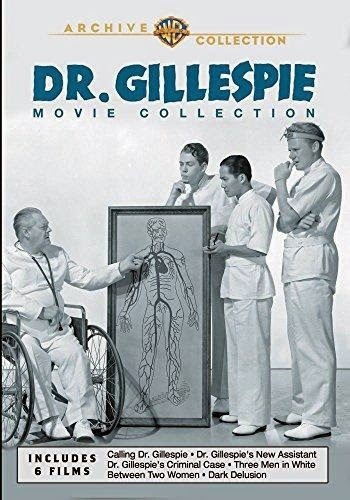 Previous reviews of films in the Dr. Gillespie Collection: CALLING DR. GILLESPIE (1942), DR. GILLESPIE'S NEW ASSISTANT (1942), DR. GILLESPIE'S CRIMINAL CASE (1943), and 3 MEN IN WHITE (1944). I'll be reviewing the final film in the series, DARK DELUSION (1947), at a future date. The trailer is included on the DVD. Thanks to the Warner Archive for providing a review copy of this DVD collection. Warner Archive releases are MOD (manufactured on demand) and may be ordered from the Warner Archive Collection at the WBShop. Please note that the initial sets of this series sold by the WB shop will be traditionally replicated (pressed) rather than burned on demand.